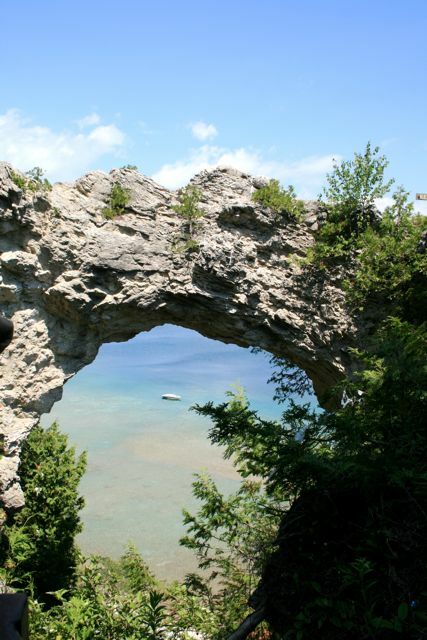 The French priest and explorer Jaques Marquette founded the St. Ignace mission in 1671. In 2010 the place has the look of a western cowboy town, don't you think? 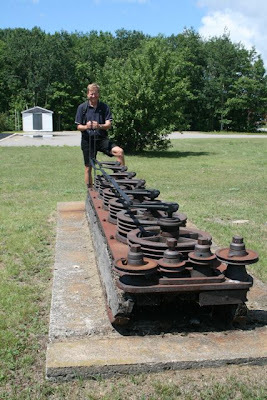 It's probably just the architecture of the period; much of the West was settled in the second half of the 19th century, which is when St. Ignace was enjoying a bit of an economic boom, as the railroad came in. We stayed three days in St. Ignace, waiting out the weather. 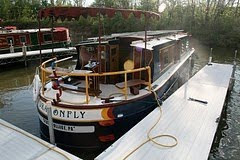 Each morning the forecast said, "Wind 20 knots, waves 4 to 6 feet," which is more than a canal boat can handle! Thursday morning we were up at 6:00 AM to take advantage of a good forecast. As the sun rose we were creeping out of the harbor; the moon, just past full, was high in the western sky. A few miles down the coast we came to a landmark for the region--and a structure that marked another turning point in our voyage. 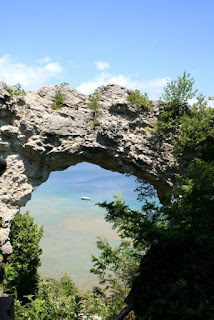 As we sailed under the famous Mackinac Bridge, we officially left Lake Huron to enter Lake Michigan. 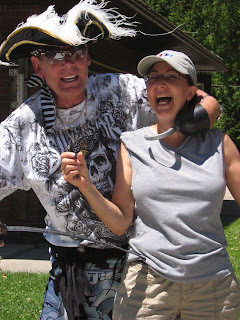 The "American Great Loop Cruisers Association" has an online store that sells swag—T-shirts, ball caps, and other logo-wear. One of the most most popular items, turns out, is a set of place mats with a map of the Great Loop route. My parents got these place mats when we left on our trip. They tell us they enjoy checking the blog over morning coffee, and then consulting their place mats, to see where we are. Yesterday Mom wanted to know, “Did you see the StrawberryIsland Lighthouse?” Apparently that’s one of the color photos decorating the placemats. Yup, we did! 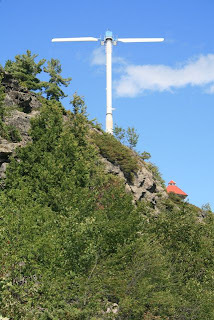 This lighthouse is near the town of Little Current. It’s typical of the lighthouses we saw along Georgian Bay and the North Channel: white clapboard sides, red roof, classic design. 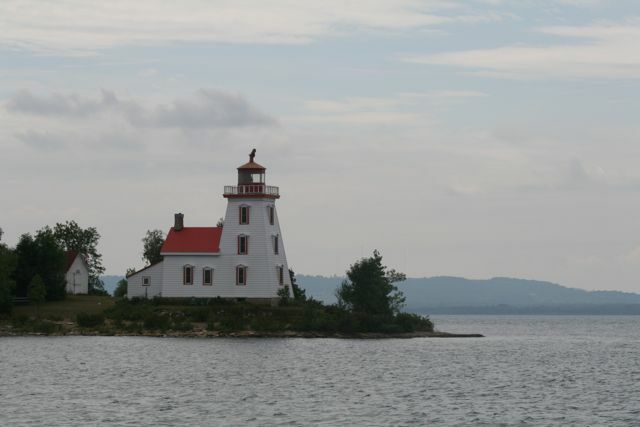 When you see one of these lighthouses, you feel compelled to photograph it! Coincidentally, when we were IN Little Current, the local paper had a lengthy article on lighthouse preservation in Canada. So based on these pictures you might think we have suddenly been teleported to Jamaica. The limestone substrate and shallow waters combine to create this tropical effect, with turquoise water and white beaches. On Friday the weather forecast was for a calm day, followed by three days of stormy weather and high waves. "Let's hightail it!" we said, and instead of inching around the coast, we pointed the nose of the boat south, across the channel, toward Drummond Island and U.S. customs. One sailboat followed us, at first just a bit of mast showing above the horizon, then gradually showing her hull as she drew closer. We watched on the chart plotter as the dividing line separating U.S. and Canadian waters grew closer. 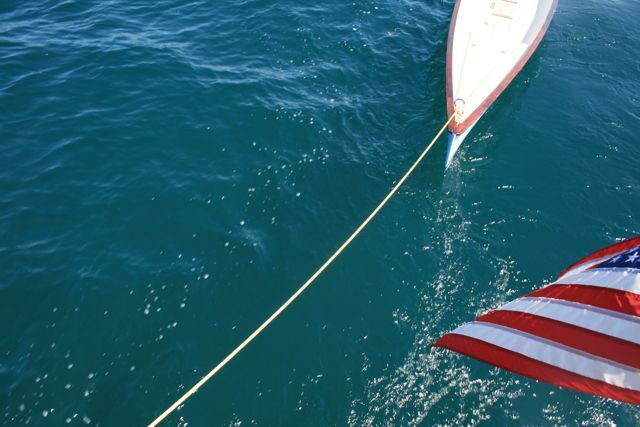 Just as we crossed the line, the sailboat shot ahead, showing us her American flag at the stern--also homeward bound. We kissed and rang the bell. It was bittersweet. We'd had weeks of perfect weather, eye-popping scenery, and interactions with Canadians who were funny and kind. 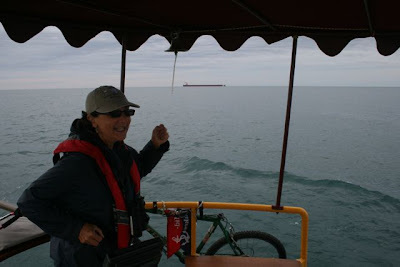 But the general wisdom, when you are doing the Great Loop is "Get off Lake Michigan by Sept. 1" and based on our rate of speed, we knew we needed to move on. 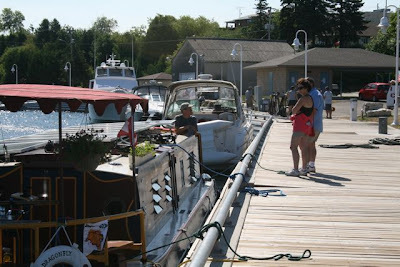 At customs--a marina dock--we worried: What would happen to the most carefully tended house plants in North America? The agent, an overweight young woman in a creased uniform and scuffed boots, was stern. "They shouldn't have let these into Canada." "Um, but they did, and they're from the U.S. originally," we said rather plaintively. She grumbled a bit more, handed us a paper with the rules and regs, chastened us a bit more, but in the end the pet plants got to stay. 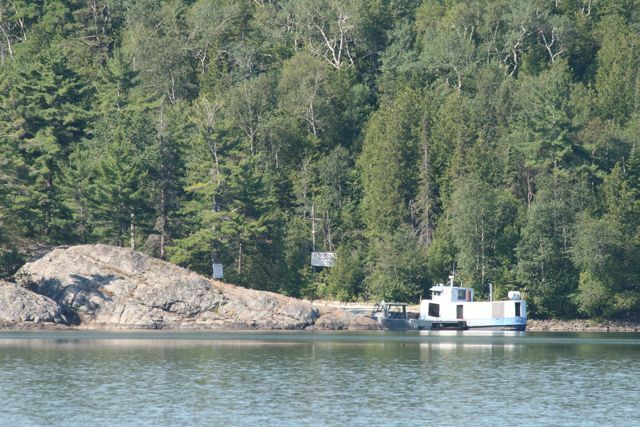 A narrow channel, De Tour Passage, leads along the coast of Drummond Island to Lake Huron proper. Big freighters use these waters, and we joked that Dragonfly was excited to see her big brothers. She wanted to race! We cruised side by side for a while. 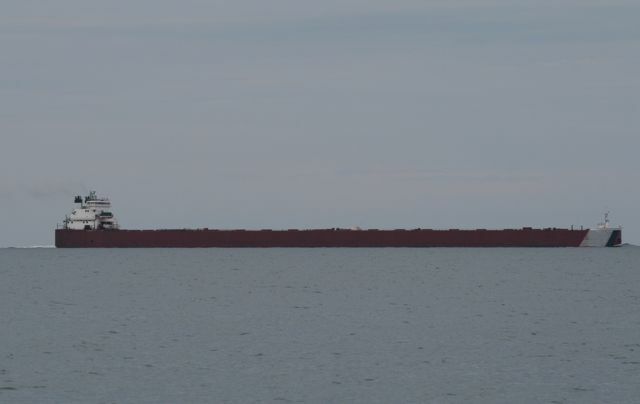 But though it looks slow, this freighter was pushing up a monster bow wave, taller than our boat. Outside the channel, the freighter kicked into gear and steamed off over the horizon. Two levers control this device. 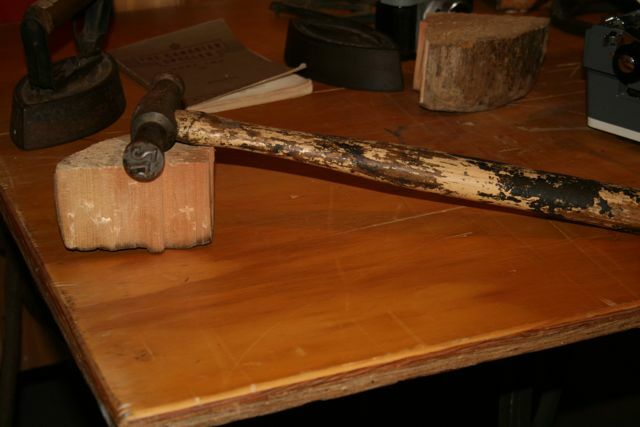 The town has a small museum dedicated to the history of logging. The part we liked best was an amazing film--shot in the late 1930s or early 1940s, by the look of the clothes and cars--documenting life in a lumber camp. The movie shows two skinny young guys felling a huge white pine with just a couple of axes; men walking on (and--brrrr!--falling off) logs floating on freezing water during a lumber drive; a cook stove being loaded on a boat while still smoking hot (the boat shoves off downriver with just a few inches of freeboard, while the cook calmly stirs a pot of beans, making sure the men will have a hot meal at day's end); a similar boat, loaded with the men's bedrolls, swamping as it navigates foaming rapids; and some fascinating, horrifying footage of work horses dragging sleds loaded two stories high with mounds of logs along roads that have been iced to ease the way. 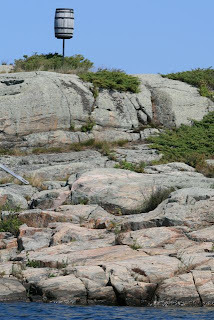 In one scene the route goes down a steep hill. The stout, thick-legged horses actually prance to avoid the unwieldy sled that threatens to crash through their heels. It's as tense a scene as anything you've seen in a Hollywood horror movie. Afterward we walked around outside and saw some of the very machinery that had been featured in this film--including THIS instrument. So, what IS it? Jim Fong and Scott Berger have correctly identified the structure in the What IS It? quiz of 7/21 as a firehouse. Great detective work, guys! But the question remains, what is the function of that funny- looking onion dome? Any firefighters out there know the answer? Meanwhile, today's "What IS It?" entry really had US perplexed when we first spotted it. That evil-looking tower on the left (it's pitch black) is SO large, you can see it from miles away. 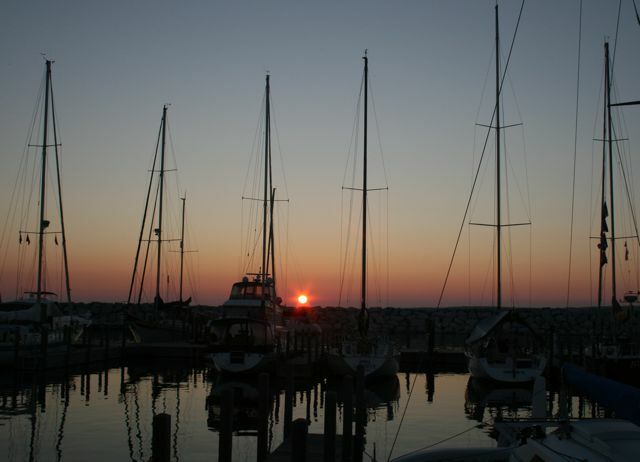 Local boaters know it as an important regional landmark for navigation. Don Heller, I can read your mind, and No, it's NOT the World Headquarters for Trojan, Inc. So, what IS it? Don't let your boss know that you are wasting valuable office time figuring these out. Miles Johnson correctly identified the photo from the July 19 "What IS It" quiz as a fishing boat, and specifically a "fish tug," also known as a "fishing turtle." 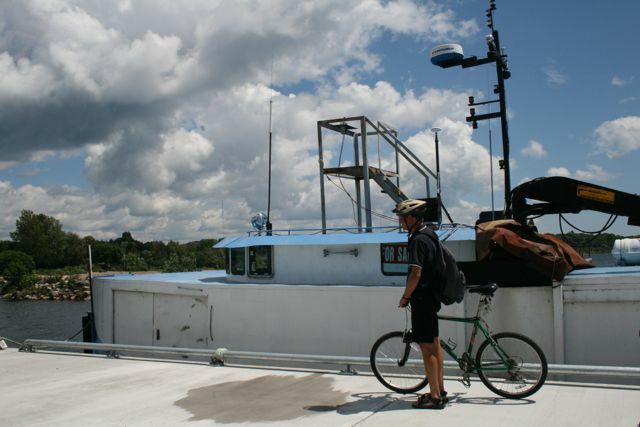 These boats were designed specifically for the fisheries on the Great Lakes. Fisherman on these boats use gill nets to snag their catch, pickerel, which (yes, this surprised me, too, because in small bodies of water in New England we think of pickerel as solitary) can form schools. We saw several of these boats docked next to the chips truck formerly known as Mr. Perch, with their transparent monofilament nets loaded in shallow metal pans, stacked on deck, ready to be deployed. Congratulations, Miles, and a tacky postcard is headed your way. And now for today's quiz. 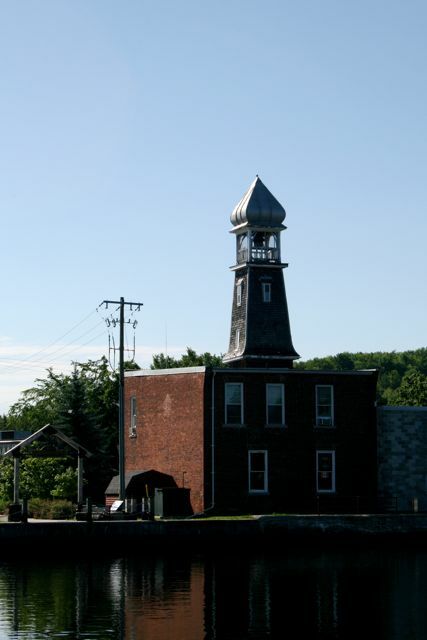 We spotted the structure at left in a small town along the Trent-Severn Waterway, and I've been dying to include it in a blog post ever since. I'll tell you what it ISN'T--it's not a church steeple. So, what IS it? Winner gets a shout-out on the blog and a tacky postcard--not to mention the deep satisfaction of demonstrating publicly your knowledge of obscure architectural features. When he's on land, the Captain likes to ride a motorcycle. He tours with a couple of buddies. One of them has a custom Harley-Davidson, glittering with chrome. The other has a monster big racing bike. When the three of them park their wheels at a restaurant to onboard a piece of pie, Harley lovers come up to tell buddy number one, "Nice bike, man!" and young guys pining after fast wheels come up to tell buddy number two, "Nice bike, man" . . . and no one notices the Captain's bike, which is a tasteful Honda ST1100 completely lacking in chrome or large exhaust pipes or racing stripes. The Cap'n has managed to be philosophical about this, mostly. Meanwhile THIS trip is making up for all those motorcycle snubs--indeed we're starting to understand how (insert name of celebrity here) feels: Wherever you go, people come running up, they tell you they admire you, they want to chat you up. This boat's as much of a chick magnet as a cute baby in a stroller or a fuzzy puppy; motor into any isolated lagoon, and pretty, suntanned women paddle up in kayaks to admire you. It gets so you expect the adulation--you take it for granted that everyone wants to meet you, admire you, hear your story. The winners of the last SlowBoat "What IS It?" quiz were GregP and Curt. 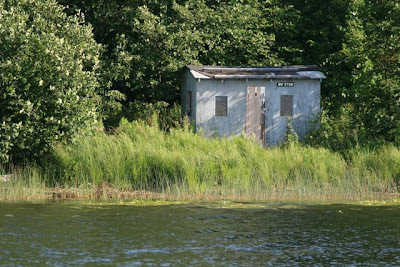 They correctly identified the small, light gray building spotted along the shores of Collins Inlet, near Killarney, as an ice fishing shack that had been hauled onto the shore for the summer. We saw dozens of these shacks along the length of the channel--some are simple and some are quite elaborate. Now for today's "What IS It?" Yup, it's a boat. The question is, What KIND of a boat? What do you DO with a boat like this? Be specific! Winner gets a shout-out on the blog and a tacky postcard from our current location. 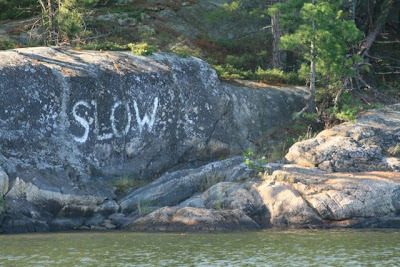 Announcing a SlowBoat Contest! From time to time we'll post oddball pictures and ask you to guess, "What IS It?" First correct answer will get a shout-out on the blog and a tacky postcard by snail mail. 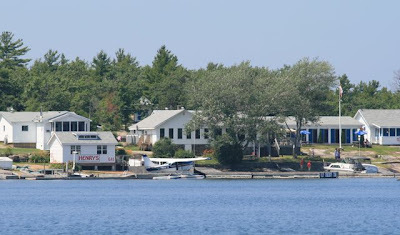 The photo at right was taken in Collins Inlet, where we saw dozens of similar buildings. 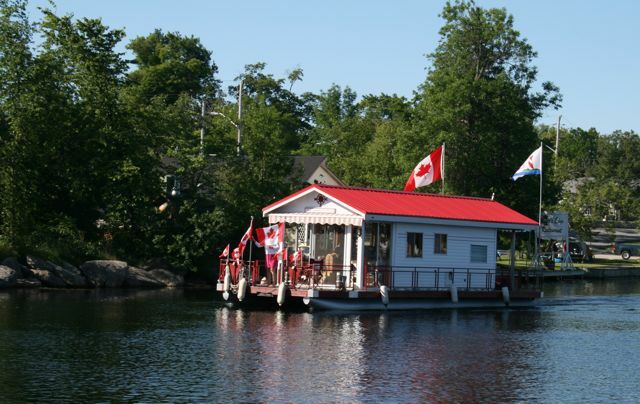 We can tell you what it ISN'T--it's not a summer cottage. So, what IS it? There's also a (somewhat new) tab on the blog called "Laughs." Check periodically for your laugh of the day. 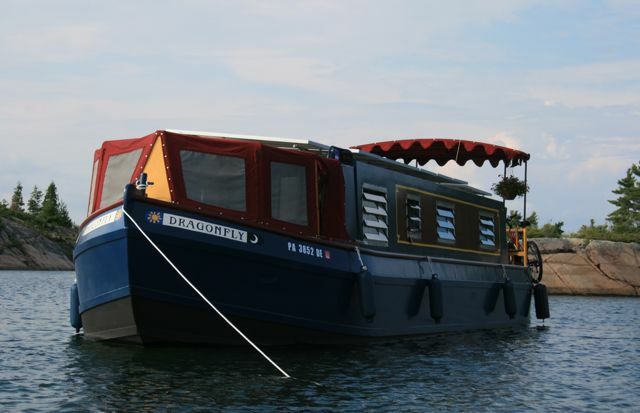 And let us know if you'd like to visit our boat. We love visitors! Did you know that you can follow this blog on Twitter or Facebook? Each time there's a new post, you'll be notified. Check the links on the home page (and if you are not sure what to do, ask the nearest teenager). 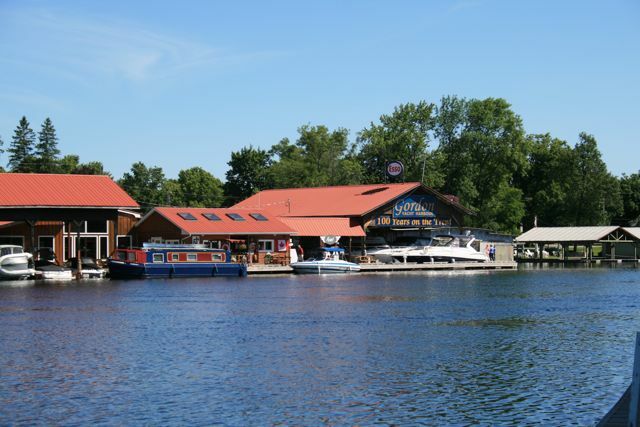 We are docked in the town of Little Current and have internet access! Another new post follows this one. Yes, the water really IS that blue. Actually, it's even MORE blue--aquamarine, shading into pure clear turquoise. And the water is clear! 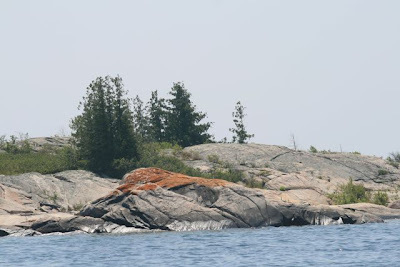 It's a bit startling--but quite wonderful--to be gliding in 20 feet of water, look over the side, and see all the way to a sandy bottom dotted with rocks. Usually navigation marks consist of red and green buoys, but on our passage through Collins Channel, approaching Killarney, we saw this directive, neatly summarizing our trip philosophy. We've been honing our anchoring-out skills the past two nights. Sunday night we anchored "Mediteranean style" (anchor at the bow, stern tied to a tree!) in a cove in the Bustard Islands. The place was like a marina, there were so many sailboats and cruisers tucked into every nook and cranny. Last night we were in a gorgeous little cove off Beaverstone Bay, and all by ourselves. We each took the dinghy out for a nice, fast row . . . which is how I got this photo. 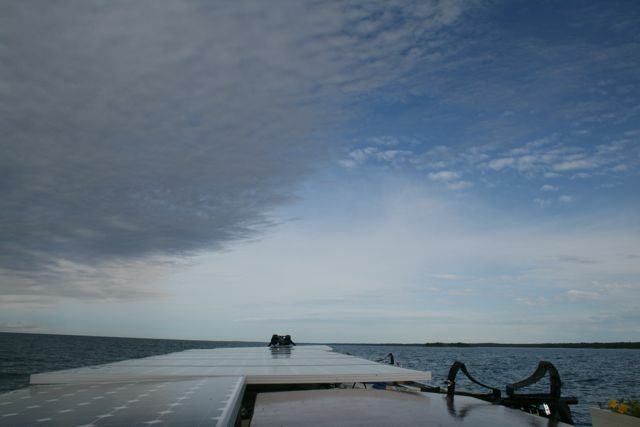 We rarely get this perspective of our vessel, and I thought to myself, so THAT's what we look like to passing boats. No wonder Trudy Jo, on Rice Lake, said, "I saw you coming up the channel and thought, "Here come the Beverly Hillbillies!" Our first day on the Trent-Severn, a large female dragonfly rode with us for quite a while, using our antenna as a perching post. 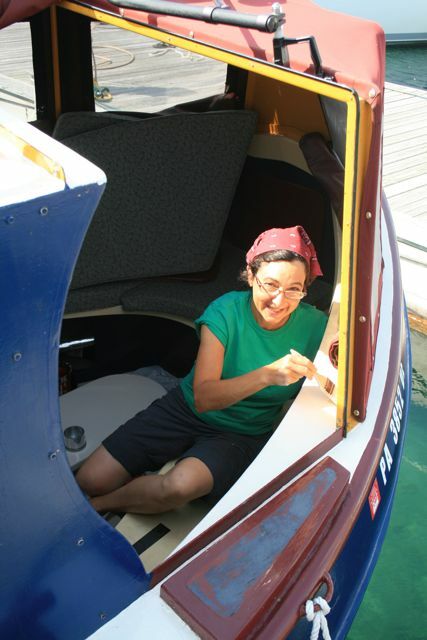 We presume she’d read the name on the stern and figured we were friendly. 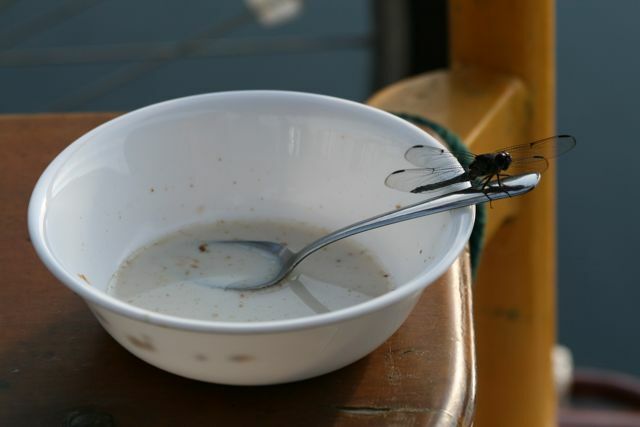 Later, at our first anchorage--in a quiet cove in Lost Channel, we shared breakfast with THIS friendly dragonfly. If you don’t care for insects you wouldn’t like this trip. We’re outdoors pretty much all day, so we interact with LOTS of different kinds of insects. The dragonflies are welcome visitors. So are the bumblebees. Each day it seems some bumblebee blunders offshore and finds our hanging basket of flowers, or our rooftop herb garden. It's a comic domestic touch to be surrounded by nothin' but water, yet to be in the midst of this peaceful backyardish scene. One bumblebee rested quite comfortably for close to half an hour in the sun on a leaf of basil. But not all our guests are so welcome. Inevitably, as the sun sinks, we get less-welcome guests: mosquitoes by the hundreds--no, the thousands. No, the tens of thousands. Thursday night, in Pengallie Bay, a woman asked where we were headed next. 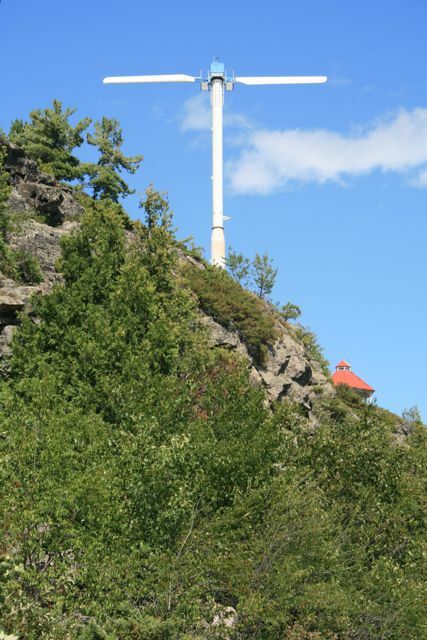 “Pointe au Baril,” I said, giving it the French pronunciation, Pwanht oh bah-reel. “That’s Point o’ Barrel.” she said, a bit sharply. (We’ve detected a bit of anti-French sentiment in some of the folks we meet). The English pronunciation does point out where the town got its name. 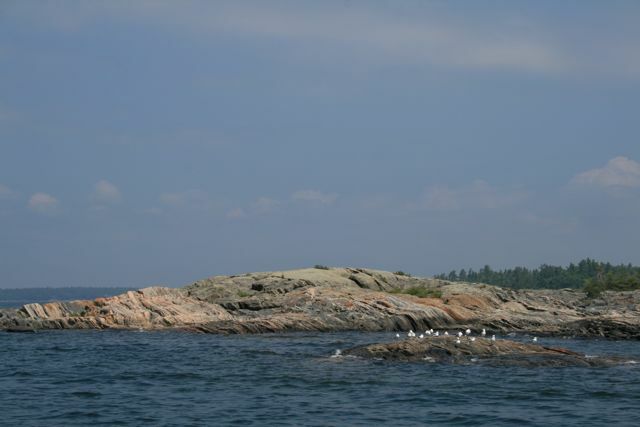 It was a fishing settlement in the late 1800s, and villagers made a kind of primitive lighthouse on a rocky point, from a barrel topped with a lantern. 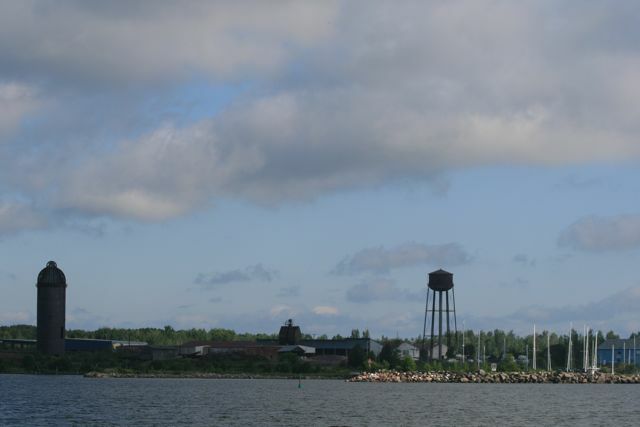 The point has a real lighthouse today--and a replica barrel (at left). The waters are not quite so tricky to navigate in the 21st century as they were in 1920, when a buoytender—the boat that goes out in the spring, amid the ice chunks, to PLACE those helpful buoys—went down with all hands. Multiple flights a day! It's like O'Hare with scenery! 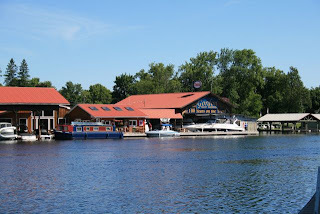 On Wednesday we cruised to an area called Sans Souci--and to a harbor on Fryingpan Island. We’d been advised to watch out for floatplanes coming and going at the dock. And sure enough, a small white plane circled and landed on the water as we were approaching. 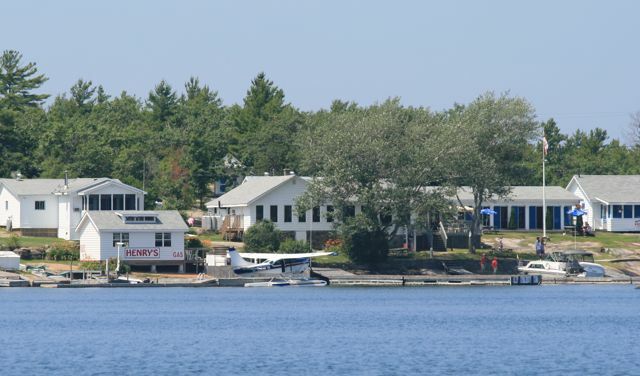 This is the home of “Henry’s Fish Restaurant and Aerodrome.” It’s been in existence for decades and we understand it’s a “must-stop” destination if you are boating in the area. There really was a Henry, a local fisherman, as I understand it, who opened a small restaurant to sell some of his catch. The place has grown . . . Henry retired . . .and he sold the business to a genial guy in a safari shirt named Paul (who answers to Henry, because that’s what people expect). Squint . . . and it's the Coast of Maine! And it really does seem like there are that many islands—rounded mounds of pink granite sprouting graceful white pines that lean away from the wind. 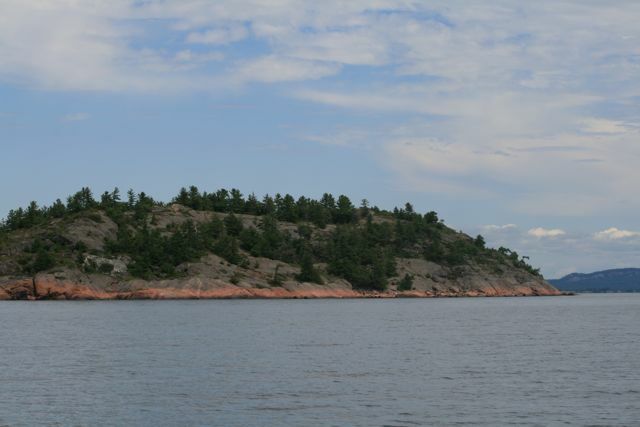 It’s not exactly wilderness camping, since you have all the comforts on your boat—soft bed, three-burner cookstove, fridge with beer—but you’re pretty much out in the middle of nowhere. If things go wrong, you need to handle them yourself. Humans have invented four different kinds of locks for use on canal systems. One of the cool things about Canada's Trent - Severn Waterway is that it has all four kinds: 1) conventional locks, where water goes in, and your boat floats up; 2) flight locks (that's two or more conventional locks, all in a row); 3) lift locks (see our entry for the Peterborough Lift Lock); and 4) marine railways. 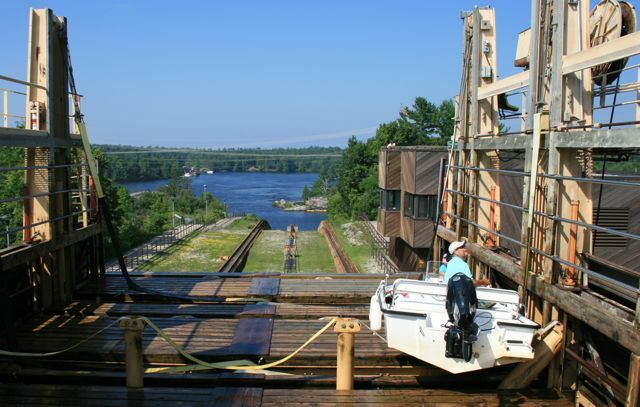 And here's what it looks like as your boat is being loaded onto a marine railway, the Trent-Severn's "Big Chute Railway." See the white motor boat? our boat is just behind it, loaded onto its own set of sling straps. The railway carries as many as 6 boats over a hill, in the process helping boats avoid a narrow and turbulent stretch of river called the Big Chute, where water flows fast down a rocky canyon. We are now off the Trent-Severn Waterway and cruising in Georgian Bay. Scenery is amazing--pink granite cliffs and white pines, like the coast of Maine. Our phone card is not performing as advertised and marinas here don't have internet, but stay tuned and we'll catch up soon, including a slide show of our boat going for a ride on a train! 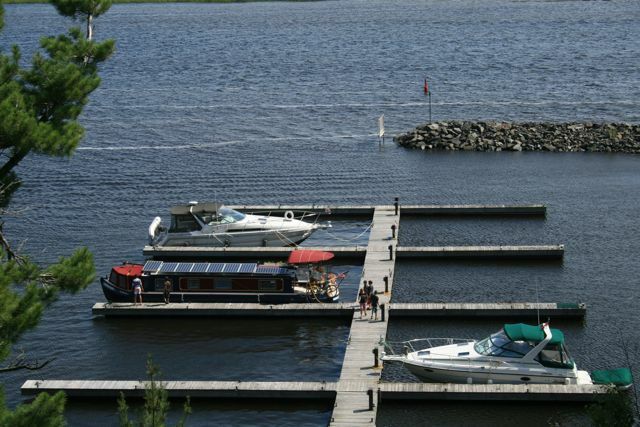 Marinas have been crowded for Canada Day weekend. Even lock walls-usually a reliable place to stay, have been full up. On Friday it got later and later . . . and no place to dock. 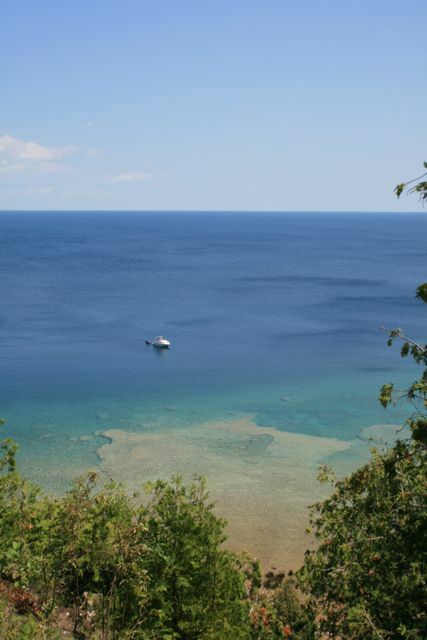 We pored over our books and charts and found this peaceful breakwater not far from the town of Rosedale. Best of all: no charge! One challenge of our trip is: Where to stay each night? We aimed to stay in Bobcageon, Ontario, on Canada Day (which is like America's Fourth of July--the biggest vacation weekend of the summer). 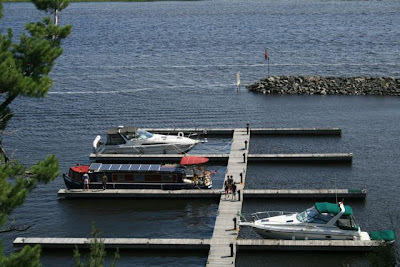 Of course, the marina in town was full up. 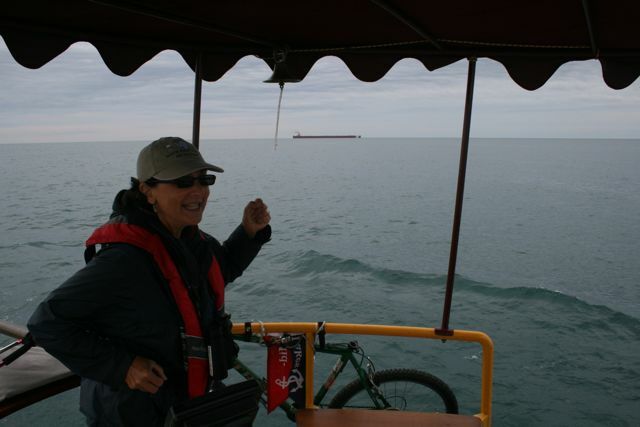 But we rafted up to the gas dock and looked desolate, and the owner kindly made a place for us. So far, cruising the Trent-Severn has been peaceful. Lakefront cottages. Tracts of forest. But, trouble loomed. As we approached the lock at Bolsover, we spotted a Viking. Well, actually it was a guy, paddling a yellow plastic kayak, wearing a Viking helmet--the kind with large plastic horns. "Prepare to repel boarders!" we yelled. Little did we know the peril we faced. The Viking turned out to be harmless, but the crew was about to be kidnapped by pirates. We happened to glance behind and saw that we were being stormed by six pirate ships, each one flying the skull and crossbones, each one with a frightening pirate captain at the helm, and each with a crew of alluring pirate wenches. Insert caption to photo below: Bill is saying "Darn, I knew there was one more modification I needed to make to OUR boat." 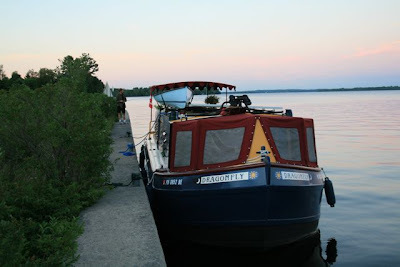 We docked next to this boat while we were in Peterborough. 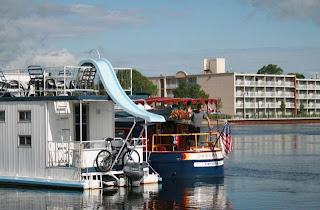 Houseboats with slides are very popular. 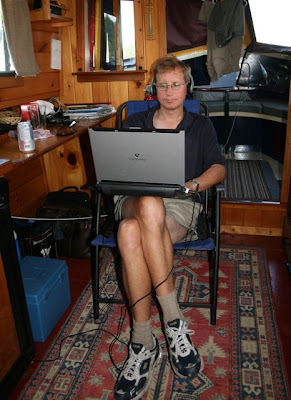 Alas most houseboaters have not read "Chapman's Boating Etiquette" and can do all kinds of imaginative things while trying to tie up in a lock. 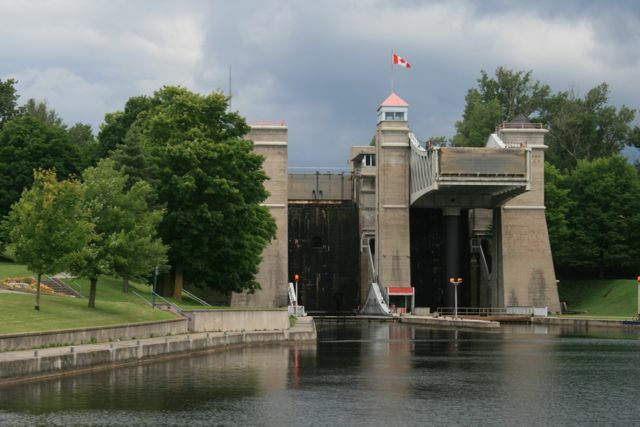 When you leave Peterborough, heading north, you encounter one of the main attractions of the Trent Severn Waterway: The Peterborough Lift Lock. Look at the right hand side, up at the top. See the structure that looks like a shelf, in between the middle and right-most towers? 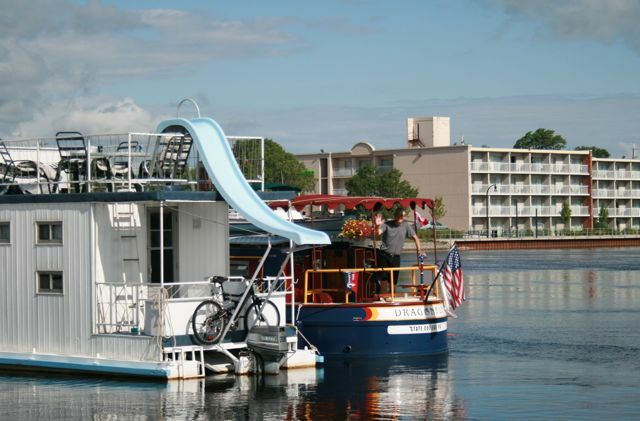 That's a big ol' pan of water, and your boat takes a ride in it!